This Lease (Lease) made as of __________, between: Commercial Property Landlord LLC, having an address at _______________________ (Landlord) and Acceptable Tenant, Inc., a _____________ corporation having an address at ___________________________ (Tenant). Premises: The Premises consist of the Building, and loading docks, parking lot area and land located on the property known as _________________ as delineated and described in Exhibit A attached hereto. Term: A term commencing on the Commencement Date and terminating ________ years from the Commencement Date unless earlier terminated in accordance with the terms of this Lease. Commencement Date: The Commencement Date shall be ____________. Annual Base Rent: Base Rent shall commence on ______________________ (“Rent Commencement Date”). Permitted Use: Warehousing, packaging, assembly of promotional materials, displays and like items and distributing of merchandise and supplies. The Fundamental Lease Provisions shall be read in conjunction with all other provisions of this Lease applicable thereto. Each reference in this Lease to any of the Fundamental Lease Provisions on pages 1, 2 and 3 shall be construed to incorporate all of the terms provided for under such provisions. If there is any conflict between any of the Fundamental Lease Provisions set forth herein and any other provisions of this lease, the latter shall control. This listing on pages 1 and 2 of monetary amounts payable by Tenant shall not be construed to be an exhaustive list of all monetary amounts payable by Tenant under this Lease. 1.2.1 Building shall mean the building upon the Premises. 1.2.2 Governmental Authorities shall mean all federal, state, county, municipal and governmental entities, and all departments, commissions, boards, bureaus and offices thereof, having or claiming jurisdiction over the Premises. 1.2.3 Landlord shall mean the party designated as such on page 1 hereof, and its successors and assigns. 1.2.4 Premises means the Building and improvements and land located upon the Property known as ___________________________________ as delineated and described in Exhibit A attached hereto. 1.2.5 Real estate taxes shall be deemed to mean all taxes and assessments, special or otherwise, assessed upon or with respect to the ownership of and/or all other taxable interests in the building and property of which the Premises are a part, imposed by federal, state or local governmental authority, or any other taxing authority having jurisdiction over the building and property excluding income, intangible, franchise, capital stock, or state inheritance taxes. 1.2.6 Rent shall include Base Rent, Additional Rent and all other compensation required under this Lease. 1.2.7 Tenant shall mean the tenant identified on page 1 of this Lease. 1.2.8 Term shall mean the period of time specified in the Fundamental Lease Provisions. Whenever the phrase year(s) or year(s) of the term of this Lease is used, the same (sometimes referred to as a Lease Year) shall be deemed to be the period beginning on the Commencement Date and every anniversary thereof (or, if such Commencement Date does not occur on the first (1st) day of a calendar month, then beginning with the first (1st) day of the calendar month next following the Commencement Date and every anniversary thereof) and expiring on the last day of the month twelve (12) consecutive calendar months later. The First Lease Year shall include that portion of the month from the Commencement Date (if the same does not occur on the first (1st) day of a calendar month) to the end of such month. 2.1 Grant. Landlord leases to Tenant, and Tenant leases from Landlord the Premises described in the Fundamental Lease Provisions and delineated on Exhibit A of this Lease. 2.2 Term. The Term of this Lease shall be for the period of time specified in the Fundamental Lease Provisions commencing as hereinafter set forth. 2.3.1 The Term shall commence on _______________. 2.4 Acceptance of Premises. Tenant shall accept possession of the Premises on the Commencement Date of this Lease. This Lease shall continue for the Term specified in the Fundamental Lease provisions. Tenant accepts the Premises as is. Tenant acknowledges that it presently occupies the Premises and therefore, is fully knowledgeable as to the condition of the Premises. By occupying the Premises, Tenant shall be deemed to have accepted the same as suitable for the purpose herein intended and to have acknowledged that the same comply fully with Landlords obligations. 3.1 Base Rent. During the Term of this Lease, the annual Base Rent shall be the sum set forth in the Fundamental Lease Provisions, which shall be payable by Tenant in equal monthly installments as set forth in the Fundamental Lease Provisions, on or before the first day of each month, in advance, payable to Landlord or Landlords agent at the address to which notices to Landlord are to be sent hereunder, or such other place as the Landlord may designate, without any prior demand therefor and without any deductions or setoff whatsoever. Tenants failure to make timely payments of rent as provided in Article 20.1 shall constitute an event of default under this Lease. Tenant may apply the Security Deposit against the Base Rent due in the last three (3) months of the Term with any difference between the Security Deposit and Base Rent to be paid by Tenant to Landlord. Any portion of the Security Deposit not applied against the Base Rent shall be returned in accordance with the terms of Article 42 of the Lease. 3.2 Upon the Commencement Date, Tenant shall maintain fire and extended coverage insurance and comprehensive liability insurance in accordance with the provisions of Article 23. Upon the Commencement Date, Tenant shall pay as additional rent real estate taxes, as defined in this Lease, for the building and property of which the Premises are a part. 3.3 Tenant shall pay to the taxing authority all real estate taxes for the Premises when due. Proof of payment shall be furnished to Landlord by Tenant upon request by Landlord. 3.4 Prorating Rent. If the Commencement Date occurs on a date other than the first day of a calendar month then the monthly rent for such fractional month will be prorated on a daily basis based on the actual number of days in the month. 3.5 The obligation to pay the additional rent in Article 3 shall survive the expiration or termination of the Lease. Tenant shall pay a late charge (“Late Charge”) of five (5%) percent (or the lawful rate, if less), of any installment of Base Rent or additional rent (or any portion thereof) that is not paid within ten (10) business days of the due date. Notice of nonpayment and the Late Charge shall be provided by Landlord to Tenant. In addition, Tenant shall pay an additional 3/4th of one percent (or the lawful rate, if less) per month for every month (or portion of a month) on any installment of Base Rent or additional rent (or any portion thereof) that is not paid within thirty (30) days of the due date and after notice of nonpayment by Landlord to Tenant. 5.1 Beginning on the Commencement Date of the Lease, the Tenant shall pay all utilities servicing the Premises. Upon request from Landlord, Tenant shall furnish to Landlord proof of payment of the utilities. This obligation by Tenant to pay for utilities and services incurred during the term under this paragraph 5.1 shall survive the expiration or termination of this Lease. 5.2 Should any utility service become unavailable from any public utility company, public authority or any other person, firm or corporation, including Landlord, supplying such utility, Landlord shall incur no liability whatsoever and it shall not constitute a termination of this Lease or an eviction (constructive or otherwise) hereunder provided that the unavailability is not due to Landlords negligence or willful misconduct. 6.1 The Premises shall be used solely for the Permitted Use set forth in the Fundamental Lease Provisions and for no other purposes except upon Landlords written consent. 6.2 Tenant shall not do or permit anything to be done in or about the Premises nor bring or keep anything therein which will in any way increase the existing rate of or affect any fire insurance or other insurance upon the Building or any of its contents, or cause a cancellation of any insurance policy covering the Building or any part thereof or its contents. Tenant shall comply with all requirements of the insurance companies insuring the Premises. 6.3 Tenant at its own cost and expense shall keep the premises clean and free of pests and vermin to the reasonable satisfaction of Landlord. 6.4 Tenant shall not remove, attempt to remove or manifest an intention to remove all or substantially all of Tenants goods or property from or out of the Premises, other than in the ordinary and usual course of business, without having first paid and satisfied Landlord for all Rent which may be due or may become due during the entire term of this Lease. 6.5 Compliance With Laws. Tenant shall comply with all applicable covenants, conditions and restrictions now or hereafter affecting the Premises; with all laws, ordinances, regulations, directives and requirements of all governmental authorities having jurisdiction over the Premises; and with any certificate of occupancy for the Building and shall not permit anything to be done on the Premises in violation thereof. Upon demand, Tenant shall discontinue any use of the Premises in violation of any covenants, conditions and restrictions, or of any law, ordinance, regulation or governmental directive or of the certificate of occupancy. 6.6 Tenant shall immediately give notice to Landlord in the event that Tenant receives notice of any violation of law, ordinance, regulation, directive or requirement of any governmental authority or any violation of the Certificate of Occupancy. 7.1 Tenant shall not make any material changes, improvements or additions to the Premises without the Landlords prior written consent which shall not be unreasonably withheld. Tenant shall reimburse Landlord (which reimbursement shall be deemed additional rent) for any and all reasonable costs, including without limitation, legal, engineering or architectural costs incurred by Landlord in reviewing the plans and specifications relating to any changes, improvements or additions. 7.2 At Landlords request and provided Landlord gives notice at the time of its consent pursuant to Article 7.1 that it would require removal at the end of the term, Tenant shall remove any changes, improvements, or additions made during the term at the end of the Term and restore the Premises to its original condition reasonable wear and tear excepted. Tenant may remove from the Premises movable fixtures, personal property and those items set forth on Exhibit B which shall remain Tenants property at all times. 7.3 Tenant may elect to add to the existing Building or construct another building (“New Building”) upon the Premises at Landlords cost and expense. Tenant shall submit a plan to Landlord of the addition or New Building for Landlords consent which shall not be unreasonably withheld. The criteria for Landlords approval shall be whether the addition or New Building is for a structure consistent with the uses permitted under the Lease with no special features making it unusable for future tenants and whether Landlord can obtain financing as specified herein. The Base Rent for the proposed addition or New Building shall be calculated on the following basis: The Landlord is to secure a loan in the amount of 100% of the cost of the addition or New Building. The Landlord shall secure a loan at competitive rates for a ten (10) year term on a twenty-five (25) year amortization schedule. The annual debt service created for this loan multiplied by 1.20 shall determine the annual Base Rent for the addition or New Building. The annual Base Rent for the addition or New Building shall be fixed for the new ten (10) year term which shall be applicable in the event of the construction of the addition or New Building. The addition or New Building shall be constructed with due diligence by Landlord in accordance with the Tenants Plan. Any addition or New Building must comply with all governmental requirements prior to the start of construction. Landlord shall at its cost and expense diligently proceed to procure necessary governmental approvals for the addition or New Building. The Base Rent for the addition or New Building shall be added to the current Base Rent on the existing facility to create the new Base Rent for the entire facility. In the event that the addition or New Building is constructed, the Tenant agrees to enter into a new ten (10) year lease for the additions or New Building from the date of the completion of the addition or New Building and its delivery to Tenant. In such event the term of the existing lease shall be extended to be coterminous with the term of the lease for the addition or New Building. During the extended term, the Annual Base Rent set forth in the Fundamental Lease Provisions of this Lease shall remain in effect for the balance of the existing ten (10) year term in respect to the existing improvements. (Tenant shall pay rent for the addition or New Building as set forth in this Article 7.3.). If the term is so extended, after the expiration of the tenth (10th) lease year of the existing initial term the Annual Base Rent per annum set forth in Article 44 of the Lease for the renewal term or terms shall be utilized as the Annual Base Rent for the remainder of the extended ten (10) year term in respect to the existing improvements. 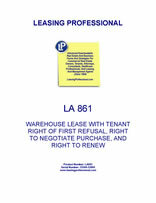 By way of example, if the addition or New Building is constructed and the extended term commences on the first day of the seventh lease year of the existing term the Annual Base Rent shall be $_______ per annum for the first six (6) lease years of the remaining term (based initially upon the Annual Base Rent in the Fundamental Lease Provisions and then upon the Annual Base Rent in Article 44) and the Annual Base Rent for remaining four (4) lease years of the extended term shall be $_____________ in years seven, eight, and nine and $_________ in year ten. In the event of an extension of the Lease pursuant to this Paragraph 7.3, the Renewal Term period shall be reduced by the period of the extension under this Paragraph 7.3. By way of example, if the Lease is extended for an additional six (6) years under Paragraph 7.3, the Renewal Term period under Article 44 which equals a total of ten (10) years shall be reduced by six (6) years for a remaining renewal term period of four (4) years subsequent to the termination of the term extended pursuant to Paragraph 7.3 (at the applicable lease year rent set forth in Article 44). Any New Building or addition to the Premises shall not be in excess of ___________ sq. ft. and any addition or New Building shall be of similar construction to the existing building with a minimum of 24 clear height with appropriate docks for this type of Building. During the first three years after the Commencement Date Tenant shall have the exclusive right to request Landlord to construct additional space upon the Premises as set forth in Article 7.3 and in the event that Tenant shall exercise such right the option of Landlord to recapture a portion of the Premises shall be null and void. After the expiration of the third lease year, provided Tenant has not requested Landlord to construct an addition or New Building as set forth in Article 7.3 then the Landlord upon thirty (30) days notice to Tenant may elect to recapture the portion of the Premises as delineated and described in Exhibit A-1 as attached hereto (“Recaptured Premises”). In the event that the Landlord provides notice of its intention to recapture said portion of the Premises the Tenant shall have the right within said thirty (30) day period to request the Landlord to construct the addition or New Building upon said portion of the Premises in which event Landlords exercise of the option to recapture the said portion of the Premises shall be null and void and Tenant shall continue to Lease said portion of the Premises. If the Landlord recaptures the portion of the Premises as set forth herein then the Landlord shall be permitted to construct improvements upon said Recaptured Premises subject to the limitations contained in this Lease and the rights afforded to Tenant pursuant to Articles 45 and 46. No use of the Recaptured Premises by Landlord or its tenants or successors shall interfere with the right of Tenant to use the Premises except Landlord shall have the right to use the Recaptured Premises as provided herein. In the event Landlord recaptures the Recaptured Premises as provided herein, Landlord and Tenant shall thereafter share use of the roadway shown on the survey attached hereto as Exhibit A-1 for purposes of ingress and egress or such roadway as otherwise agreed by the parties. Landlord shall pay for any costs associated with sharing the roadway and changes to the roadway, e.g. widening, relocation costs, maintenance and repairs. Landlord shall be responsible at its sole cost and expense to obtain any required governmental approvals arising from the sharing of the roadway. Landlords use shall not materially interfere with Tenants use of the roadway for the Tenants Permitted Use as set forth in the Fundamental Lease Provisions. In the event of a dispute relating to the roadway if the parties cannot agree the dispute shall be submitted by the parties to the American Arbitration Association (or its successor) for resolution. The fees and charges of the American Arbitration Association and arbitrator shall be shared equally by the parties. The decision of the arbitrator shall be final and binding upon the parties. In the event that the Landlord elects to recapture said portion of the Premises then Landlord shall pay real estate taxes and other charges and costs attributable to the Recaptured Premises, shall insure the Recaptured Premises with the same coverage required of Tenant under this Lease and shall defend, indemnity and save harmless Tenant from and against all fines, suits, claims, demands, losses and actions (including attorneys fees) for any injury to persons or damage to or to loss of property on or about the Recaptured Premises. Tenant shall have no responsibility for the Recaptured Premises and shall be relieved of any and all further responsibility in respect to said Recaptured Premises. If the Landlord recaptures the Recaptured Premises pursuant to the terms of the Lease the reference in the Lease to the Premises shall thereafter not include the Recaptured Premises. 8.1. Tenant will not in any manner deface or injure the Building, and will pay the cost of repairing any damage or injury done to the Building or any part thereof by Tenant or Tenants agents, employees or invitees. Except for the roof, Tenant shall maintain, repair and take good care of the Premises whether interior or exterior, structural or non-structural or whether capital or non-capital and keep the Premises free from debris, waste and nuisance of any kind, at its cost and expense in accordance with the Repair and Maintenance schedule attached hereto as Exhibit C. Tenant shall keep the Premises, including but not limited to, all mechanical systems, the heating and air conditioning system, plumbing, electrical systems, overhead doors, loading docks and related mechanisms, equipment and fixtures in good condition and working order, reasonable wear and tear excepted. Tenant shall be responsible for the removal of all garbage from the Premises in accordance with law. Tenant shall store its garbage pending removal in a neat and orderly manner. The performance by Tenant of its obligations to maintain and to make repairs or replacements shall only be performed by contractors and subcontractors of Tenant reasonably approved in writing in advance by Landlord, it being understood that Tenant shall procure and maintain, and shall cause contractors and subcontractors engaged by or on behalf of Tenant to procure and maintain, insurance coverage against such risks, in compliance with Article 23 hereto. If Tenant fails to perform such maintenance and/or to make such repairs or replacements or to take steps to have defective or damaged condition(s) corrected within fifteen (15) days after the occurrence of damage or injury, or detection of such condition(s), Landlord may at its option make such maintenance and/or repair or replacement, and Tenant, shall upon demand therefor, pay Landlord for the cost thereof as additional rent. At the end or other termination of this Lease, Tenant shall deliver up the Premises with all improvements located thereon (except as otherwise herein provided) in good repair and condition, reasonable wear and tear excepted, and shall deliver to Landlord all keys to the Premises. 8.2 Within in twelve (12) months of the Commencement Date Tenant shall pave at its sole cost and expense the parking lot in accordance with a paving plan attached hereto as Exhibit C.
As a condition precedent to Landlord giving advance written consent to Tenants use of outside contractors and subcontractors for repairs and/or maintenance of the Premises or replacements (“Repairs”), Tenant shall obtain and deliver to Landlord, on Landlords written demand therefor, a list of all contractors, subcontractors, materialmen and laborers involved or to become involved in such work. If any mechanics or materialmens lien is filed against the Premises, for work claimed to have been done for, or materials claimed to have been furnished to Tenant, such lien shall be discharged by Tenant within thirty (30) days thereafter, at Tenants sole cost and expense, by the payment thereof or by filing any bond required by law. If Tenant shall fail to discharge any such mechanics or materialmens lien, Landlord may, at its option, after five (5) days written notice to the Tenant, discharge the same and treat the cost thereof as Additional Rent payable with the monthly installment of Base Rent next becoming due. Such discharge by Landlord shall not be deemed to waive, or release or excuse the default of Tenant in not discharging the same. Any such Repairs shall be conducted on behalf of Tenant. In the event Landlord shall give its written consent to the making of any such Repairs by Tenant, such written consent shall not be deemed to be an agreement or consent by Landlord to subject the Landlords interest in the Premises, the Building or the land to any mechanics or materialmens liens which may be filed in respect of any such Repairs made by or on behalf of Tenant.